Gardening in the fresh air and sunshine is a real stress-buster when you have the right tools. This SONGMICS 3-piece Garden Tool Set is perfect for all gardens and indoor plants. The durability of aluminum combined with great rubberized hand grips makes Songmics Garden Tool Set pragmatic for a variety of garden work, which are easy to clean. 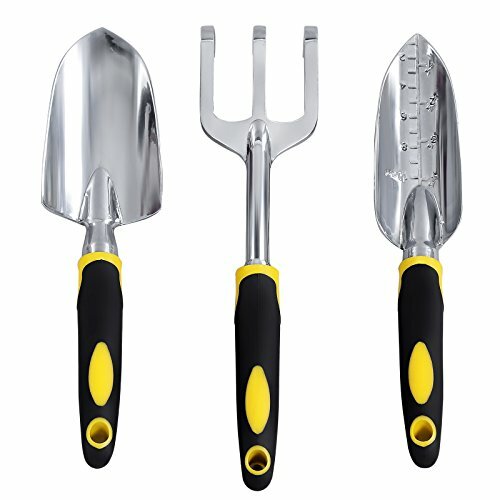 This 3-piece tool set includes: transplantor, cultivator & trowel: The transplanting trowel has depth measurements on for quick reference. And This tool is perfect for delicate transplanting jobs. The cultivator hand rake is perfect for cultivating around plants. And you can also use it to loosen soil, remove weeds and aerate soil. The hand trowel is suitable for all small digging jobs when planting, taking up plants, turning up earth and more. Specifications: - Material: TPR; Aluminum - Package Size: 13 3/8" x 2 7/8" x 2 1/8" (31 x 7.5 x 5.5cm) - Shipping Weight: 1.2lb (0.54kg) - Stain Resistant: YES - Ready to Use: Yes Package Contents: - 1 x Trowel - 1 x Cultivator - 1 x Transplanter - 1 x Instruction Notes： - Always clean and dry the gardening tools after use.